#055 Should You Work on Free Kicks? I made some great progress on several projects last week and I’m looking forward to sharing more about them in the coming weeks. We’re streamlining the way we share all of our information here at WORLD CLASS COACHING and I think it’s going to be great for coaches that listen to the podcast, read our blogs and watch our videos. Look for more info in the coming weeks. Thanks to everyone that gave the podcast a ranking or review in iTunes. I appreciate you helping us spread the word about the show. The review by Robinar009 was selected randomly to receive a free eBook. Please send me an email and we’ll make arrangements to give you access to the eBook of your choice. I received an email from a coach in Virginia asking about free kicks for youth teams. This has been a topic on my list for a while now so his email got me thinking about it. The question that I’ve discussed with other coaches is ‘How much time should you really spend on free kick?’ I think it’s tricky. Today I’ll talk about what I think is appropriate for each age group. As well as give examples of the key concepts and actual restarts I teach my own teams at each stage of development. I’ve come across some very good videos of several free kicks that could be useful for your teams. I’ll talk about them on the show but be sure to check out the show notes below to see them in action. Corner kicks and free kicks create a lot of goal scoring opportunities but I spend a very limited amount of time working on them. I only have so much training time with my teams and there are so many important technical and tactical aspects of the game that the players need to learn. So the time I do spend on restarts is focused on principles of the game that apply to more than just free kicks. At the club level you will usually only get your players twice a week, maybe three times. If you’re coaching a high school or college team you’ll see them a lot more and since the players are more experienced you don’t have to spend as much time teaching technique so you can spend more time on tactics and set pieces. Today I look at each level of the game and my suggestions for the best way to approach free kicks for each group. I think that short corners are the best approach for young teams taking corner kicks. The setup is simple and easy to teach. I usually teach my teams during a couple of scrimmages before our first game of the season. The more opportunities they have during the games the more they’ll begin to see the option and learn to make the best choice. Anytime we have a free kick that we can’t shoot, I want my players to look for a pass to keep possession and work on building the attack. I don’t think there’s anything to learn from just launching a ball from our own half to get it as far up the field as possible. If we’re able to shoot then I want the shot to be to the far post. The other players should move to attack rebounds and be sure to stay onside. It’s important to young players to understand the purpose of throw ins is get the ball back in and keep possession. Just throwing the ball as far forward as possible serves the same purpose as just kicking the ball forward on a free kick. Your team usually ends up losing the ball and wasting an opportunity to keep the ball and build an attack. As I’ve mentioned in the past, I teach my teams to pass the ball out from goal kick. If your players take up the positions above they will spread the defenders out enough to create open passing options. I want us to put two or three players in front of the ball on free kicks that are close enough for a shot on our goal. At this stage I don’t spend time worrying about having them take away one side of the goal or the other. I just want them to get in the way of the shot. Keeping the ball from going straight to the goalkeeper is important to making sure your team has the best chance of scoring from these situations. The server should keep the cross away from the goalkeeper but putting a player in front of the keeper will also keep the ball alive more often. In an 8 v 8 format I put three players on the top of the box and keep two defenders back to cover. Two of the players at the top of the box attack the cross while the player at the far side bends their run to attack any ball that makes it through. This is a great variation from the same setup. Having the player in front of the goalkeeper check toward the ball to receive it and lay it back creates a better angle for a cross or shot on goal. The ball can also be dribbled or passed to the middle for a shot. When defenses start to push up for free kicks and hold the players farther from the goal it creates an option for the ball to be served in between the goalkeeper and the line of defenders. The key is to pass the ball far enough away from the goalkeeper but still behind the defenders. This is the time to start having defenders on the posts for corner kicks to help the goalkeeper cover the larger goal. It continues to be important to stay between the attacker and the goal and compete for the ball so that the attacker can’t get to the ball first. I want a wall for free kicks that covers one side of the goal and make the goalkeeper responsible for the other side. With more players on the field in the 11 v 11 game we are able to commit more players forward on corner kicks. I still keep one player in front of the goalkeeper to prevent them from collecting it easily. Four players start grouped together at the far side of the ‘D’ at the top of the box. I keep one player, usually a holding midfielder at the top of the box to shoot anything that comes to them. We always want to have one more defender back than the attacking team has forward. From this setup the four players at the far side of the break out with one player running near post, one inside the far post, one to the penalty spot and one to the outside of the far post. I’ve shown the formation above without the defenders so that you can see how the players are organized more clearly. This spreads our players out so that they can cover all of the dangerous areas in the penalty area. It also means that our player taking the corner knows what to expect from the attackers in the box. This is a simple variation that is great for taking advantage of an overly aggressive offside trap. The player in front of the goalkeeper shows for a short pass but instead of passing it back he dribbles toward the halfline. It’s important that the kicker moves back with him to stay onside. This causes the defenders to push up in an attempt to trap us offside. The ball is then ‘back heeled’ to the original kicker in the space behind the defense. Our players then run back in to finish from a ball played on the ground across the box. At this age I want the goalkeeper to start taking charge of organizing the wall. We usually want two, three or four players in the wall depending on the distance and angle to our goal. On corner kicks I want to players defending the top of the six-yard box on corner kicks or free kicks from very wide area. This is in addition to the players that are marking man-to-man. A fun and competitive way to work on converting from free kicks to to make it a game. Form two team and give them each a chance to attack and defend once. Each team gets four corner kicks, two wide free kicks, two central free kicks, Two throw ins from each side and four penalty kick. 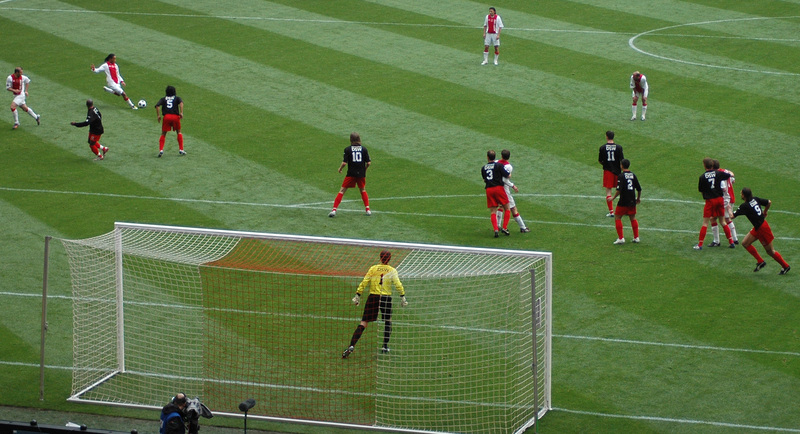 The ball is live until a goal is scored, it goes out of bounds or is caught by the goalkeeper. The team that scores the most goals wins. This game gives the players a lot of opportunities to work on attacking and defending free kicks in a competitive environment that you don’t get by just lining up and taking corners. At this level you’re spending more time with your team, usually four or five days a week, and you can afford devote more of it to working on set pieces. Here are some interesting ideas for free kicks that I’ve used with my own teams. These are some great variations on indirect free kicks from the middle of the field. Here are two great corner kicks from the same game. The video also breaks down the movements making it easy to see how you can teach your players how to perform them. Here’s a link to a post with my favorite free kick play from the U.S. National team. They used it in this game against Belgium in the 2012 World Cup. There’s certainly a place for working on restarts at every level of the game but I feel that as with everything else, it is focused on the needs of the player at each developmental level. There’s no point in wasting valuable training time trying to teach most U12 teams how to do the central free kick performed by the US in the World Cup. You could spend an entire training session on it and use it only once or twice in a season. But if you progress through each level of development then you’ll be building on a solid foundation that will not only make the players successful from restarts but also give them a better understanding of the game in general. I will be giving away a free eBook of your choice to one person who leaves a review on iTunes between now and April 6, 2016. Next week I’ll have a complete training session on another area that I think is often overlooked, running with the ball. This is very different than dribbling to control the ball or beat a player. If you’ve ever had a player find themselves in wide open space only to be caught from behind or lose the ball because of a heavy touch this will be session you’ll be interested in. With the new birth year mandate, I would love to see a podcast on the transition from 8v8 to 11v11, and the transition from U11 to U13 (2004 birth year players).